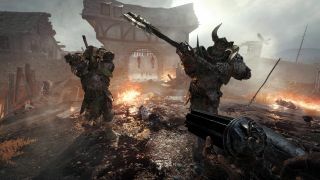 You can pick up rat and chaos-slaying co-op game Warhammer: Vermintide 2 at a very reasonable price today. Fanatical has Fatshark's fantasy sequel on-sale for $17.99/£13.79, which according to Steamprices.com, is cheaper than it's ever been on Valve's platform—if you don't have it already, it's well worth picking up for that. This offer runs for six more days from today. Steven gave Vermintide 2 80% back in March. "Vermintide 2 succeeds on the merits of its stellar combat and level design," he said. "After nearly 40 hours, that Rotblood warhorn signalling a zerg-like rush of raiders, or the sound of a Gutter Runner assassin chattering in the darkness, still turns my blood to ice." The game's changed a little since then, including tweaks to the difficulty and loot. I played a bunch of it over the weekend, which offered double XP for my trouble. In all honesty, given how much I play games like Vermintide 2, and how little repeating levels many times over appeals to me, it actually felt like the right pace for unlocks and progression. But hey, that's just me. Either way, it has the best first-person melee feedback I've ever experienced in a game.